I wish to express my utmost gratitude to you for giving me permission to visit School today 02nd April 2019 to address the Assembly and read today’s lesson from Paul’s Chapter 12. Further you allowing me to hold a Q&A session with the Upper Sixth. I do hope I managed to give back something, something minutely to the young lads from my global travels and experiences. I trust the spark I lit will be a small positive contribution to their journey today and further when they leave the sacred sanctuary of BCS, entering the “Big Jungle” of a frightening world out there. It was indeed an emotional reading in the Chapel ; you have been most kind to have always welcomed me to School; also my wife Ann-Sofie, my son Dhani. You opened the gates to my daughter Radhika and her fiancé Daniel in March 2010; they being BLESSED in our School Chapel prior to their wedding nuptials at Neemrana Fort on 4th April 2010. You even sent four of your well trained racing pigeons which were released by Radhika on 5th April, the day after her wedding. Three flew back to Bishop Cotton School; one decided to convert to a free spirit and spread good tidings in another free space. Today I came as a representative of my Class of 1970; we would be celebrating our Golden Jubilee in 2020 and with your kind permission would like to coordinate this in School as per your suggestions and directive. I was delighted to see continuous improvements in the School, being done with great fervour. I departed from School today with more humility in my heart, to do good in the world.. always as an Ambassador of Bishop Cotton School. I would also like to Thank Senior Master Mr Boyd and Mr Praveen Dharma for giving me so much of their time today. With Warmest Regards and Every Best Wish Sir. It is always a pleasure having you and all well-meaning Cottonians back in school to interact with those currently studying here. This entry was posted in News, Post and tagged 1970 Batch, BCS, GOLDEN JUBILEE, News about OCs, Roy Robinson, Vivek Bhasin on April 3, 2019 by admin. BACK TO SCHOOL ~ FUN TIMES! “What a great reunion, ending with the School song sung after dinner with great gusto by the class of ’62 in close huddle with the entire upper 6th form on the 1st flat! We took that party late into the night in the hotel and needed (at least I did!) most of the next day to recover. But it was all well worth it and many thanks to everyone for making this such a memorable trip. In particular thanks to Neel, D. Singh, Mamik who went out of their way to help with the planning & logistics. Also to the wives who, I think – and hope – have an appreciation of a close bond that has lasted 55+ years. Great memories and best wishes to all! Jyoti & R S Sodhi. These evenings generated sufficient enthusiasm with each dinner actually being an event. Bunty and Toti distributed mementos and Neelam & Ruby adding to the gift box. They even did the entrance of their house to represent the School,and boy, was that an evening !! I have recalled and mentioned these exceptional dinners but need to give credit to Ranjana Dutta, Umesh‘s wife, for the house scarves that she knitted for each one of us. Thank you. The numbers of guys committing themselves for the reunion in Simla held strong for a long time until the drop outs at the last minute some for good reasons but the others were exceptional for the excuses they offered, imaginative by any standard!! The numbers were still significant. Most of us took the train from Delhi to Chandigarh while RS Sodhi and Manjit Kochhar drove all the way up to Simla. The experience was different with those going by train getting the benefit of being met at Chandigarh station by Suksham, Davinder Singh Jaaj‘s lovely wife. She presented each of us chocolates and a warm hug at the station. We assembled at the Eastbourne Hotel on September 28, 2012. That first evening, at our request, the Headmaster, Mr Roy Robinson, arranged for the boys of lower and upper 6th Form to meet with us at 6.30 p.m. He was there on the first flat to receive us and escorted us to the meeting over which he presided. Each of us introduced ourselves to the boys, briefly informing them about our time in school, mentioning our particular achievements and then giving them an account of what we had done after leaving school. Thereafter, Mohit, Umesh and D Singh interacted with the boys wanting to know about their aspirations, their ideas of their areas of interest and their possible career plans. Surprisingly, these boys knew so much more about the opportunities available than we did at their age !! The boys were also encouraged to ask questions, which they did. It was a good interaction and it went on for more than an hour. Later that evening we hosted a dinner for Dorothy, the Headmaster’s wife, Mr Roy Robinson and the Housemasters at our hotel. It was a splendid day and we all felt that it had been good, informed and educative. Next morning, much against the wishes of most, we were requested to attend a special service in the Chapel at 8.30 a.m. You must remember that the effects of the previous night’s drinking had not quite worn off and most of us were, initially, reluctant to attend. However, we were all there in our blazers, ties and presented ourselves as pretty specimens of well turned out Cottonians. Most of us are natty dressers. Justice R S Sodhi read out that famous passage from the Romans leading to our motto. Mohit, who is an excellent extempore speaker, spoke about career choices that the boys could consider. Both delivered their messages with confident ease. Mohit’s talk was wide ranging and informative. The School will want him again when career choices becomes a whole new subject. September 29, 2012 turned out to be a long and eventful day. We were taken around to view some of the excellent work at the arts and craft exhibition. The standards are just as good as they were but there was more creativity on display with the use of newer techniques. This was followed by lunch, with each of sitting down at our respective house tables. It felt awkwardly familiar!! After lunch, we were invited as the group to be the Chief Guests for the annual athletic meet, the sports day. 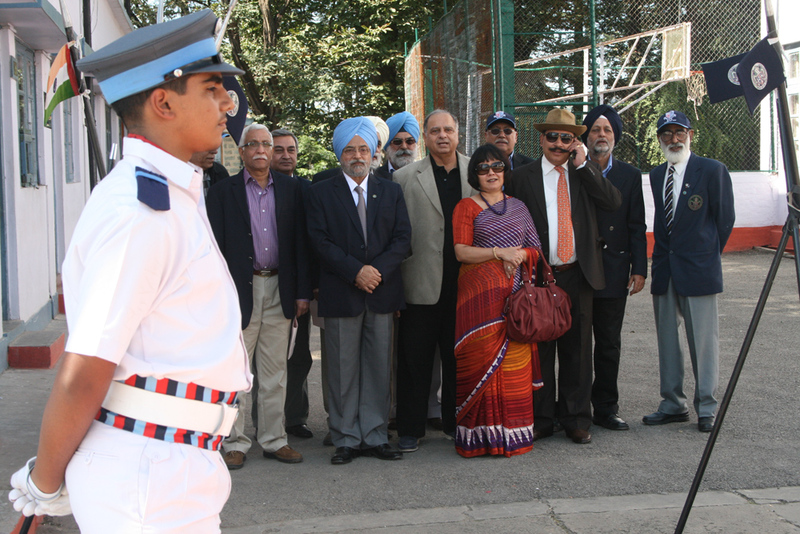 Two smartly turned out NCC cadets escorted the Headmaster, his and our group to the podium to inaugurate the event. Justice R S Sodhi led our team by releasing a pigeon as a symbolic gesture. Each of us was then requested to repeat in releasing a beautiful white bird. It felt different to be the guest of honour. Very nice. The entire afternoon we watched the athletics activity culminating in the tug-o-war. Sitting in pavilion gave us a lovely view of the activity with tea and snacks being delivered from time to time. We were feted and we were treated exceptionally well. At the prize giving function we were requested, one by one, to come forward and award the prize to the winner of an event. The honour for the best athlete of the event, the Victor Lodorum prize was given away by Toti Agarwal who was the best athlete and had won the same prize 50 years ago.! Very fitting. Most of the records that stood in our time now stand demolished. The boys who finish school are just a wee bit older at 17 or 18. Besides our finishing school at an earlier age, we observed the diet and the food was of a higher standard. This is no reflection on Mrs Murphy, who was the head of the School kitchen when I joined in 1953. Her Irish stew and bread and butter pudding are still the best that I have ever had!! Justice Sodhi declared the meet closed. N K Mehra goes on to add, “After the dinner the boys from 6th form gathered on the 1st flat made a circle, in which we all joined and sang the school song. it was an indescribable event, full of emotions. I think I may have shed a tear. It was a memorable event, even magical! They all felt that should have spent another day in School and Simla. The writer feels that this was just right. A high is a HIGH, do not blow it !! To almost all of us the idea of coming back 50 years later would have been unthinkable in 1962. It did even seem absurd at that time. So when we returned to Simla to celebrate our reunion, the walk from the hotel to the Main School gate, past the Linlithgow dormitory, the Chapel, the tennis court and on to the view of the Main building, a flood of feelings overwhelmed us. In those few minutes, a thousand memories returned – names, faces, places and events that represented some of the best years of our lives. We were also apprehensive of the reception that would be accorded to us but on that score you left no doubt. Dorothy, your wife, and you were impeccable hosts as was the rest of the staff. The graciousness, the splendid organisation, the attention to detail and the way in which we were welcomed was amazing. It was nice to feel that we still belonged to the place that had once been our own!! You have our grateful thanks. That feeling of sadness of 50 years ago was replaced so fully by a sense of pride that even our wives knew that they were on a journey that spoke of a strong bond. The School displayed all the values and the systems we were taught would hold us in good stead in the world outside. You gave us honour, respect and warmth, emotions that we will carry with us for the rest of our lives. This was a rare moment in any life. You just made it different and memorable in a very special kind of way. This entry was posted in News, Post and tagged 1962 batch, BCS, Events, Get together, GOLDEN JUBILEE, Reunion on November 15, 2012 by admin. This year we are celebrating the Golden and Silver Anniversaries of the ’62 and ’87 batches. While we are getting the ’62 batch in top gear – they have had a number of meetings towards this – but no one from the ’87 batch has contacted the OCA office. Those interested please get in touch! A dinner was organized at Toti Agarwal’s house on May 4, 2012 for the 1962 batch. They are having several round of dinners and this is the second one. There are more to follow. Important to note that Bunty, Toti’s wife, created the house flags and emblems. Terrific atmosphere. Click here to view the photos. This entry was posted in Events, Post and tagged 1962 batch, 1987 Batch, Celebration, Events, Get together, GOLDEN JUBILEE, Networking OCs, Reunion on May 10, 2012 by admin. Sukhinder Singh, Billy Gill, Adarshpal Singh, accompanied by Ajay Thiara drove in yesterday [17th Sept] morning from Chandigarh for this dinner. The dinner which began early at 7.30 pm concluded almost near the mid-night and these gentlemen then drove right back last night. They were sleeping when Ashok Mulchandani rang to seek some assistance and advice!! What do you expect ? !! The pictures that Sudhir Khanna took, and sent as a separate mail with a Picassa link, simply indicate what a lovely evening it was. What I am doing is sending some of these pictures with the names of the persons labelled (left to right pattern) so that you can identify the persons in the respective pictures. Unfortunately, the quality of my attachments is not outstanding but Sudhir’s mail will give you a much better idea. Go full screen and a slide show to get the complete effect of what a group with an average of 60 can do and enjoy an evening! We take this opportunity to wish the 1961 batch a happy and lovely reunion. This entry was posted in Events, Post and tagged 1961 Batch, BM Singh, Get together, GOLDEN JUBILEE, New Delhi, Reunion, Sudhir [Chottu] Khanna, Vijay Khurana on September 22, 2011 by admin.